Growing up in northeastern Ohio afforded me the opportunity to play amongst and experience some of the most beautiful hardwood trees. I like to say that it was playing in the woods of Ohio where my woodworking began. From my earliest memory I have been enchanted by trees and wood. I try to maintain that spirit of play in my work today. I take inspiration from the strength, grace and shape of a tree and try to translate that in the shape and form of my furniture. I enjoy the process of design and construction in wood tremendously and still feel the inspiration that began playing amongst the rolling ravines and hardwood trees in northeastern Ohio. I moved from Ohio in 1998, and since then my passions have taken me all over this country. I first moved to Missoula, MT to study forestry at the University of Montana. I immediately fell in love w the vast western landscapes, and w my passion for rock climbing as a vehicle, I embarked on years of traveling and climbing in the western US. To support my climbing and traveling I worked as a carpenter. I soon found myself wanting a deeper engagement in the work and material. Searching for the outlet for this, I ended up at the Center for Furniture Craftsmanship in Rockland, Maine. Here my eyes were really opened to the depth of the work and art that can be played out in wood. From Maine I took a circuitous route thru much of the west and landed in Fort Bragg, CA. 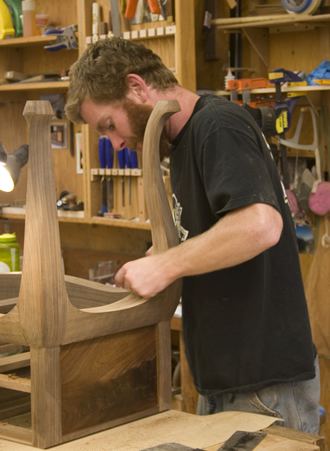 There I studied the Krenov way for two years at the College of the Redwoods fine woodworking program. The books by James Krenov and the College of the Redwoods as a whole have had an immense influence on my life, and woodwork. When I left Fort Bragg, I was filled w excitement for all the possibilities for artistry in wood and equipped w a basis of technical skills to execute all of the ideas, shapes and forms that I can dream up. I have been fortunate to have seen so much of the tremendous landscapes of the US. Pursuing my passion for woodworking and rock climbing has taken me from the Atlantic Ocean to the Pacific Ocean, and through the awesome deserts and mountains in between. Balancing these two pursuits has always been a difficult task for me, I really believe that one fuels the other. So much of the inspiration that I have for my designs in wood come from my love of the natural landscapes. In recent years I have moved back to Missoula, MT and set up a small furniture shop. 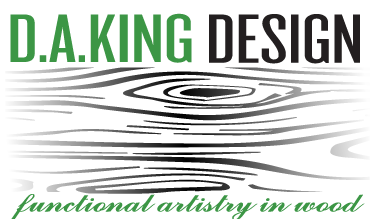 Here I am really psyched to continue exploring new designs and artistry in wood.